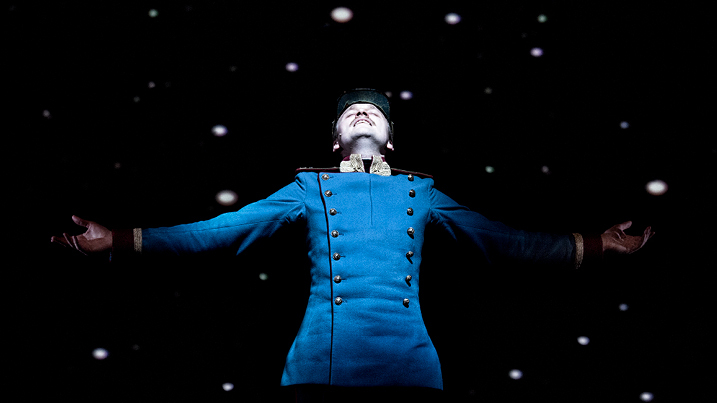 Two theatre greats create this dazzling portrait of a Europe stumbling towards chaos. Schaubühne Berlin (Hamlet, Sydney Festival 2010) presents its first work with Complicité (UK) director Simon McBurney (The Encounter, Sydney Festival 2017). This bold, technically adventurous and sexually charged staging of Austrian Stefan Zweig’s 1939 novel is a masterful and newly prescient portrait of a Europe stumbling toward chaos. Written over a period of years and completed when Zweig was exiled in London, Beware of Pity follows the misadventures of Anton Hofmiller, a young cavalry officer who falls in love with Edith, the partially paralysed daughter of a local landowner, then breaks her heart. Overwhelmed by guilt when the girl takes her own life, Anton enacts a well-meaning but tragically wrongheaded plot to put things right. Schaubühne Berlin premiered Beware of Pity in 2015, before playing a critically acclaimed 2017 season at the Barbican in London. Adapted and directed by Complicité co-founder Simon McBurney, Beware of Pity arrives as old certainties and diplomatic niceties are being swept away; when international relations have become a compulsive soap opera. Warnings In German with English Surtitles. This performance contains strobe lighting, theatrical blood, pyrotechnics and smoking. Short lockout applies. Save 10-25% Off A Reserve Tickets by booking a group of 10 or more. *Discounts for Group bookings of 10+ available by calling the Box Office on (02) 9250 1999 or in person. The only authorised ticket sellers for this event are Roslyn Packer Theatre, Ticketmaster and Sydney Festival. Only tickets purchased by authorised agencies should be considered valid and reliable. Grab your friends and enjoy a shared feast before heading into the theatre. Choose 3 entrees from the a la carte menu and enjoy with a jug of sangria to share, all for $65.